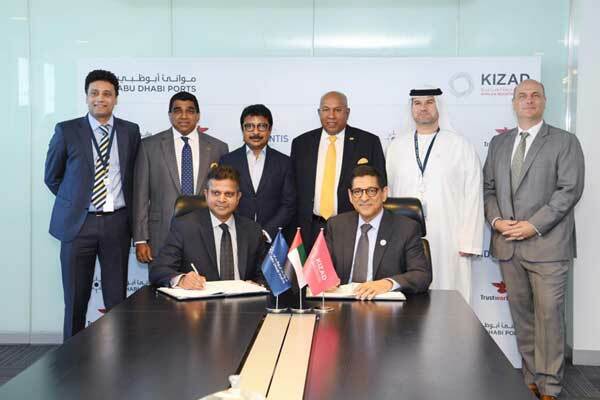 Dubai-based Trustworthy.ae Group plans to invest Dh365 million ($100 million) in Khalifa Industrial Zone Abu Dhabi (Kizad), to develop an inland container depot (ICD), a third-party container freight station (CSF) and other port-related services over the next five years. Kizad is one of the largest industrial zones in the Middle East and a subsidiary of Abu Dhabi Ports. Future investments will entail the development of engineering services, third-party logistics, marine services, retail and hospitality, said a statement. Construction on the container freight station and inland container depot, which will be developed on a 1.4 million sq ft land plot, will commence in January 2019 and is set to become operational by June 2019. Hayleys Advantis Limited, the transport and logistics arm of Sri Lanka’s Hayleys Group, will operate the facility. Hayleys is the first Sri Lankan-listed company to cross $1 billion in turnover in fiscal year 2017/18. Container volumes in Kizad are expected to grow exponentially from 1.5 million twenty-foot equivalent units (TEUs) to 8.5 million TEUs over the next five years. “Our state-of-the-art inland container depot and container freight station will provide world-class and most reliable services to our clients across various industries,” he said. “The potential growth in container volumes over the coming years in Kizad implies the need to build an integrated facility within the port and together with our partners we will provide services such as container handling, repairs and maintenance,” he added. “This new container freight station will form an integral part of our thriving ecosystem at the industrial zone, which already offers world-class infrastructure, free zone and industrial zone solutions, dedicated investor support, and a strategic location with access to regional and international markets,” he said.